What are the Label and Roll Specifications for the LX400 and PX450? > Knowledge base> Article: What are the Label and Roll Specifications for the LX400 and PX450? *Thru-hole opening should be rectangular with no rounded edges. If absolutely necessary, for some applications the width of the thru-hole can be as small as .25" (6.4mm). ** The Reflective/Black Mark should be opaque to infrared light. The mark should be between the labels. The end of the mark should correspond with the beginning of the next label. ***There are two factors that determine whether the printer will accept any particular stock thickness. 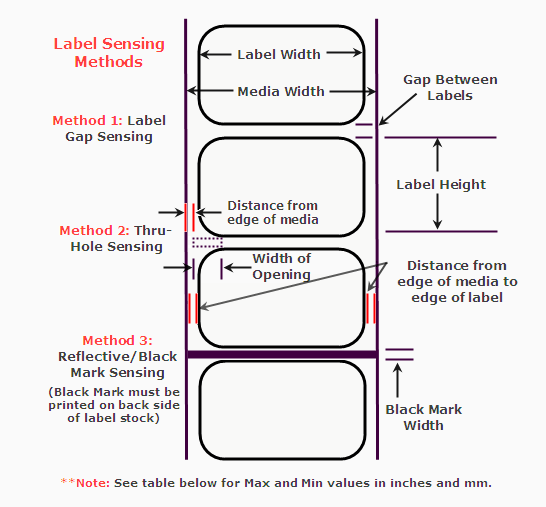 If you are printing in continuous or reflective label sensing mode, number 2 does not apply. The fact that the printer must read through the backing in die-cut mode will limit the thickness much more than the printers ability to pull the paper through the print area. However, if you adjust opacity level of the liner enough to allow the label to be seen by the stock sensor, the thickness will only be limited by the printers ability to pull it through the printer area. For these reasons the weight or thickness of the liner is a variable that can not easily be defined. Primera recommends and uses 40# liner with all label stock. It is important to test all label stock with the intended printer before ordering large quantities! 1. 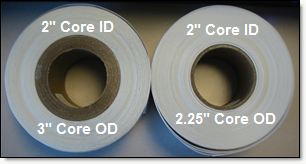 Label heights less than or equal to 1.5” requires a 2.00” I.D. x 3.00” O.D. core. Label heights greater than 1.5” requires a 2.00” I.D. x 2.25” O.D. core. 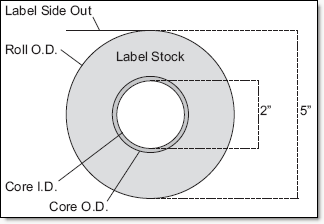 --Explanation - label heights of 1.5" or less tend to maintain the rounded shape of the core even as they are unwound off the roll. Because these labels are rounded they can interfere with the printhead. 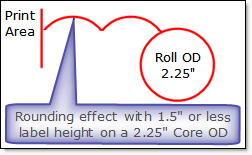 This is solved by increasing the OD of the core to minimize the rounding effect. 2. Turret glue or 1/2”-wide 3M 928 double-sided removable tape must be used to attach stock to core. Removable tape must be positioned across full width of core. The tape must easily detach from roll so that the last label can feed through the printer and trigger the out of stock message. 4. Masking tape or equivalent may be used to secure label stock to outside of roll.